Have you seen the latest blog? The world famous resort of St Ives in west Cornwall is renowned for the scope, breadth and depth of its musicality. The choir plays an important role in the life of the local community. We are a mixed choir of around forty members. We give performances of modern, traditional and sacred music, choosing from our repertoire to suit the audience and venue. The choir exists to give an opportunity for those who love to sing and have fun doing so. We practice once a week and give concerts to varied audiences, mainly in the local area. Our concerts have raised thousands of pounds for local and national charities. Visitors are welcome to listen in during our practice evenings. You may decide to join us! New members are always welcome. 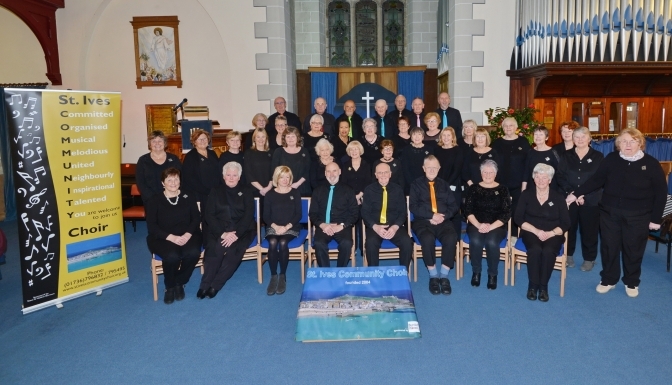 We are members of the Cornish Choirs Association and Choirs on the Net, and are hoping to soon be a part of the National Association of Choirs. The choir generally sings in four part harmony, with sopranos, altos, tenors and basses. Sometimes the men sing in unison for a three part harmony and occasionally the ladies split into three parts. Our uniform is usually black. The ladies have broches and the men have coloured ties of their choice. This is for more formal concerts. If we are outdoors or at less formal settings, the choir chooses what is considered most appropriate for the occasion. May Day Celebrations 11:15am outside the Guildhall, St Ives, on 6th May.